David’s first email account was with the now defunt freeserve, and his address was dl.cook@epistole.freeserve.co.uk. He had to pick a unique name to put in front of freeserve, and he chose “epistole”. 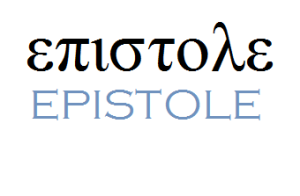 The inspiration was from his knowledge and love of New Testament Greek – the root of epistole means “I send a message”. It is also of course where the word “epistle” comes from. Paul’s epistles ( or letters) were possibly David’s favourite section of the Bible to preach from. He certainly cho se to study & preach from them on many an occasion. Epistole is all about communciation. David’s family decided to make some of the materials he left us with available online for anyone interested to read, listen to and/or use. So here they are on this website, we commend them to you and wish you God’s blessing. We hope you find them useful, please feel free to contact us and let us know if you do.